Supporting your school's parent teacher association need not be a chore. Get involved, help out at a school fundraiser and have some fun! We all want our kid's schools to be the very best they can. 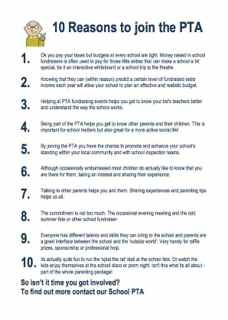 The way we can help best is by joining the PTA and getting involved in the life of the school. Its not just our kids and schools that benefit. You might just find you end up involved in a lot of fun too. 1. Ok you pay your taxes but budgets at every school are tight. Money raised in school fundraisers is often used to pay for those little extras that can make a school a bit special be it an interactive whiteboard or a school trip to the theatre. 2. Knowing that they can (within reason) predict a certain level of fundraised extra income each year will allow your school bursar or headteacher to plan an effective and realistic budget. 3. Helping at PTA fundraising events helps you get to know your kid's teachers better and understand the way the school works and all the problems, challenges and joys they find in their work. 5. 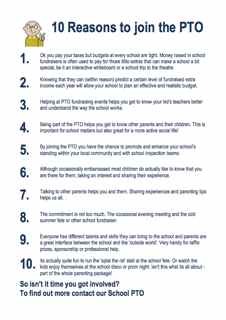 By joining the PTA you have the chance to promote and enhance your school's standing within your local community and with school inspection teams. 7. Talking to other parents helps you and them. As we all find out, kids don't come with instructions. No sooner do we feel we have learned to deal with one thing and there is something else to address. Sharing experiences and parenting tips helps us all. Often this is as simple as knowing the ratio of 'incidents' and problems in other households. "Phew maybe we're not a 'problem family' after all! 8. If you work it out the commitment is not too much. The occasional evening meeting and the odd summer fete or other school fundraiser. 9. Everyone has different talents and skills they can bring to the parent teacher association. The best PTA's are inclusive and find ways of incorporating all the different things that people can offer. Be that a fantastic cookie recipe for a bake sale, an ability with something like graphic design or computers or the commitment to run the weekly football training. Similarly parents are a great interface between the school and the 'outside world'. Very handy for soliciting raffle prizes, sponsorship other gifts in kind or professional help. 10. Its actually quite fun to run the 'splat the rat' stall at the school fete. Or watch the kids enjoy themselves at the school disco or prom night. Isn't this what its all about - part of the whole parenting package! If you have not yet discovered the joy of helping your school's parent teacher association please have a think about it. Its a great way to help our schools, our kids and build the sort of communities we all want to live in.